When you search Google or use Amazon, you might assume the results you see are the same as those viewed by your friends, family and other internet users. But you’d be wrong. Websites and social networks track your location and search history and make assumptions about your age, race, gender and political views to create a profile of who they think you are. They then show adverts they believe to be the most relevant, in order to maximise clicks, and personalise which results you see by filtering out what they think is irrelevant. This is sold to the public as positive - making each web session relevant and interesting - yet is leading researchers to fear the so-called ‘filter bubble’ could widen divides between the North and South, rich and poor, and young and old. To assess the extent to which personalisation is having an effect on our society, Princeton University has created bots, each with their own fake profiles. These bots have different fake ages and genders, each of them earn a different level of money, are virtually based in various locations around the world and have different interests. By using these bots to scan and search the web, the researchers hope to create a picture of not only what each of them sees, but also what sites they are missing out on. WHAT IS THE FILTER BUBBLE AND HOW DOES IT CAUSE DIVIDES IN SOCIETY? The filter bubble is when a website guesses what information a particular user wants to see. It uses information it knows, from a person’s search history and location, and attempts to guess what it doesn’t. It makes assumptions about a person’s wealth, based on where they live and work, for example, or looks at their credit score. It guesses a person’s age by comparing what they’ve searched for with what people of the same age are searching for. Some algorithms can also scan personal social network profiles, for example, to fill in the knowledge gaps. Political views and opinions can then be garnered from various sources. This tracking is all done using cookies installed on websites and browsers. 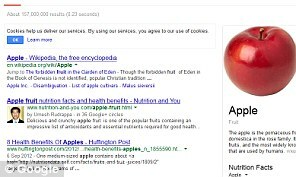 For example, if two different people search for the word ‘apple’ they could get different results. If their age and search history suggests they like tech and gadgets, a search for ‘apple’ will show results for Apple iPhones, iPads and Apple-related news stories (pictured left). If the person searching regularly checks in at the gym, or is a keen baker, or does grocery shopping online, the algorithm might decide they are instead looking for the fruit (pictured right). This means they push Apple products down the list and in some cases the irrelevant results aren’t shown at all. When it comes to wealth, if users are only ever shown particular products, job adverts and so on, they will never increase how much money they earn or how much they spend on items; widening the rich and poor divide. In terms of politics, if a user has previously searched for details about a particular political party or policy, or live in a Labour stronghold as an example, when they search for news they may be shown more left-leaning publications or links. This means alternative policies are hidden, meaning their beliefs are constantly reaffirmed and they only deal with like-minded sites and people. Researchers fear this can prevent change as well as widen the gaps between political groups and lead to a state of isolation. Personalisation also has its benefits. Shopping sites such as Amazon, for example, can scan a user's search and purchase history to offer suggestions. This can help find similar, cheaper items or items that are more suited to their needs at a glance, without having to perform additional searches. 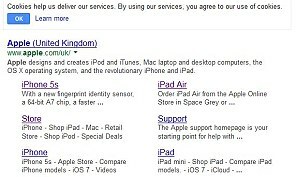 It's also possible to disable personalised adverts and results. Google's search engine lets you switch off personalisation, for example. 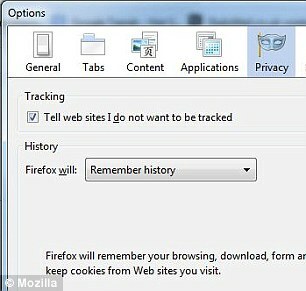 While all web users can enable the Do Not Track features built into the major browsers. They believe that just because people have opposing views on certain topics, doesn't mean they won't share interests in others. To this end, they created a recommendation engine that makes filter bubble-style assumptions to create a profile, but then widens the results to show opposing views that a user may also be interested in. 'We nudge users to read content from people who may have opposite views, or high view gaps, in those issues, while still being relevant according to their preferences,” Graells-Garrido told MIT Technology Review. The team scanned thousands of tweets to establish a wordcloud.They looked at people who tweeted about a certain topic and then looked at what other interests they had tweeted about previously. When a user searched for a particular topic, the recommendation engine would not only show similar links, it would also show interests that may overlap, but may not share the same view. Their results discovered that people can be more open to ideas that are different from their own and people who are opinionated, appreciate the opinions of others more.